JD Focus is the cleanest and advanced multipurpose/Ecommerce Joomla template. It superbly befitted package for all type of business websites, It quite fantastic option for Ecommerce website because it integrated with j2Store and HikaShop. Both are such powerful extensions, allows you to set up the online shop in just a few minutes. Besides that, It coded cleanly, that makes this theme super sober in looks. With the JD Focus, there is no requirement for any technical knowledge, coding skills; you can manage your website your own. JD Focus built with Quix Pro Page Builder, SP Smart Slider Pro, provides 4 colours presets, 3 menu types, boxed and full-width layout types and many more other features. With JD Focus, you can choose multiple catchy pre-built color options to choose from. You can even add or delete any color as per your needs. This template comes with 2 main layouts for your site, Full-Width or Boxed and you even have the ability to select from custom layouts of your website. The other premium tool included in the package is Smart Slider 3 Pro, the most powerful and intuitive Joomla plugin to create sliders which was never possible before. Currently, JD Focus is on sale for $39 at JoomDev. With that, you will get future updates and 6 months support ftom the theme developers. You can also download the free version before you buy. Once your payment is complete your account is immediate active, this generally takes less than a minute to occur. JD Focus comes packed with quickstart package with demo data installer (Joomla 3.8, recover template, used extensions, demo content – all included). Once you install the quickstart, you’ll have a replica of the live demo. 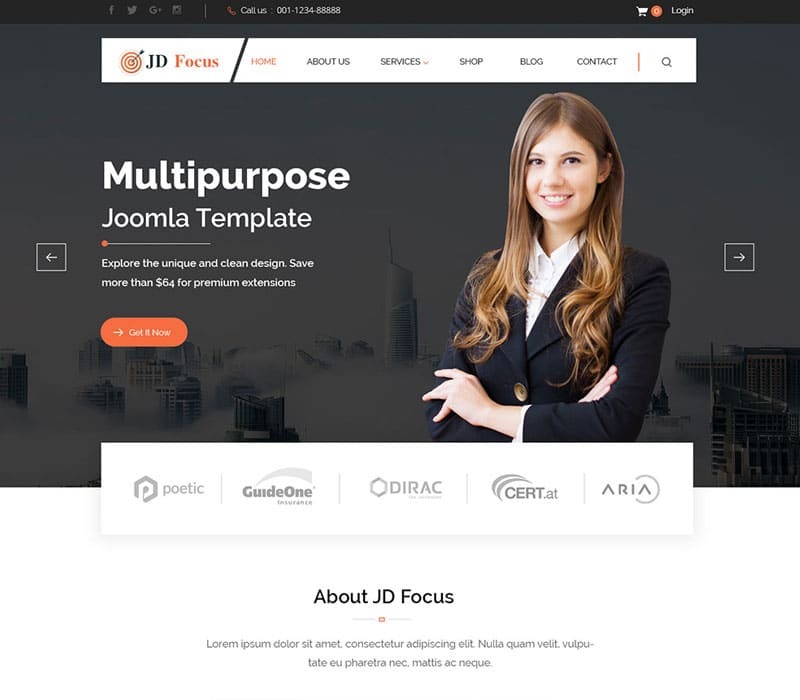 JD Focus is a beautiful and intuitive Joomla template. This template is focused on providing a modern, clean layout, with a good use of white space surrounding the different elements. You can also use the full set of theme customization options to adjust the overall design and appearance of your site. And Thanks to the simple manual install of demo data, you can start building your site quickly as soon as you replace the demo content with your own content and finish all desired settings. JoomDev is an international software design and development company that builds comprehensive, custom solutions for enterprise mobile and web. We combine our engineering expertise with our elegant design aesthetic to deliver exceptional results for category leaders in manufacturing, healthcare, financial services, and retail.